All transactions are safe and secure with a reliable history in online purchasing behind each of our associates. 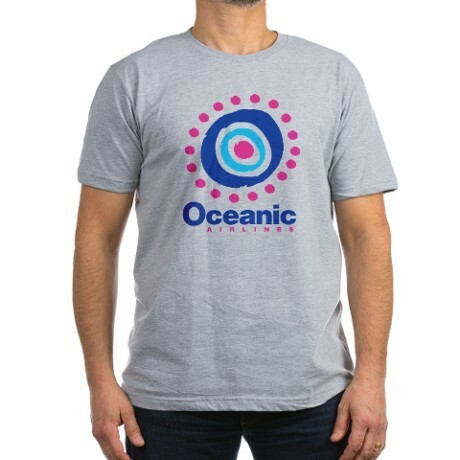 Buy the Oceanic Airlines t-shirt to own Lost clothing and merchandise. This bestselling Oceanic Airlines Lost t-shirt lets everyone know that you're one of the unlucky ones who ended up stranded on the island. The front of the tee features the official Oceanic logo. Wear it to celebrate the Oceanic 6 who made it home, including Jack, Kate, Sayid, Sun, Hurley, and Aaron (Claire's son). Let's just hope that Hurley doesn't try playing the Mega Lotto numbers, "4 8 15 16 23 42" again. They never seemed to bring the stranded Oceanic passengers much luck. Who knows, they just might end up back on the island. In addition to the Oceanic Airlines tee above, browse the Lost Clothing Gallery for more apparel like men's and women's clothes, kids shirts or hoodies.